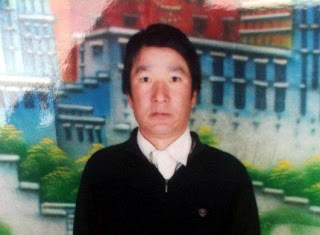 Info: Sonam Dargye, a 44-year old father of three from the town of Rongpo, is the second Tibetan in the Rebkong area to set fire to himself. 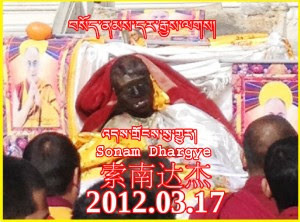 Images and footage that emerged almost immediately from Tibet shows thousands of Tibetans in Rebkong (Chinese: Tongren), Malho (Chinese: Huangnan) Tibetan Auonomous Prefecture, Qinghai (Tibetan area of Amdo) gathering to mark the passing of Sonam Dargye, a Tibetan farmer who died after self-immolating near the center of Rongpo town on Saturday (March 17) (VOA, 19 March 2012). A video released by VOA and shared by Tibetans on Facebook shows the body of Sonam Dargye still aflame in the middle of the street in Rongpo town, as hundreds of Tibetans gather around. Footage can be viewed at Voice of America’s Tibetan service here.